and in 2006 OS-Kema joined the pack! Adopted on Friday, June 13th, 2003. He has been renamed Katzaboo, but they still call him Boo for short. Drambuie is came into rescue at the age of approximately 3 years old. He was originally found as a stray on the streets of New Jersey, and his sun-bleached coat told the tale that he had obviously spent most of his life outside. After a short stay at the local Humane Society Saloon, he found himself in the comforts of a loving foster home. Well on Friday the 13th, Drambuie found his forever home. When the appointment was scheduled for Friday the 13th, we knew in Boo's strange world it would be good luck! Drambuie now lives with Bob, Jennifer, a cat and their female Lab-GSD mix named Kylie. their crates and did a little bickering at each other... but the two eventually settled down. Since last night Boo has been out for a car ride to the pet store and introduced to the neighborhood. Bob (his new dad) reported that Boo rode like a perfect gentleman in the car. Kylie and Boo are doing even better together in the house this morning.... around and around chasing each other... over the couch... launching into the air, into the kitchen over here and over there.... ever so often the play inside seems to increase... they have a little bicker... then settle down. The two are both soaked in drool! However, Boo did decided to chase the cat twice today.... Bob told him to no... Boo stopped then he praised Boo... He said Kylie does the same thing. As I was talking to him I could hear Kylie doing her playful bark at Boo.... Boo was on the couch taking a breath.... and off they went again as Boo lauched into the air off the couch and Kylie took chase. his home on Friday the 13th:)"
In February 2005, Ebony came into rescue a three month old puppy and had the puppy attitude to go with it. Audrey, Ebony’s foster mom did a great job getting this little pup ready to become part of a family, forever. On April 2, 2005 Ebony was fortunate enough to be adopted by previous TOTTSHR adopters, Bob and Jennifer. She was renamed Sitka. Sitka joins not one, not two, but three other canine companions, Katzaboo, (formerly Drambuie) who was adopted from TOTTSHR in 2003, Kylie and Tasha. This quartet is making glorious music together and the one feline in the house doesn’t seem to be bothered by the new addition. The magical woos and howling that make up their songs have just gotten more robust with Sitka there. September 23rd 2006 OS-Kema joined the pack! This was previous adopter's who adopted Drambuie and Ebony. Ebony was adopted just last year and she was a little puppy when we last saw her and now, well she is no longer a puppy that's for sure! She is more like a ...HORSE! She turned out to be a beautiful splash coated large female who is the ruler of her castle:) Drambuie is also doing great and he is a king with a harem of females. After much debate between Molly and Kema, Robert and Jennifer chose Kema and were really impressed with her play skills and the way she held her own with the FOUR giant dogs that were coming at her. Kema is the tiniest pixie of a dog at only 35 pounds or so. She was just adorable and at 2 years old will not get any bigger. The dogs in her new home dwarfed her today. They chose a winner and she was really at home with them. After consulting with our vet, it was determined that there was no chance of a full recovery (and a very slim chance that he would even get partial use of his front legs). The calcification was starting on other vertebrae, and even with sending him to a neurological specialist, it was very likely that he would continue to suffer from paralysis, and have to endure weeks of painful recovery, with no quality of life. Based on this, my wife and I determined that we simply could not see him suffer, and made the very difficult choice of having him put to sleep. In the end, both my wife and I were there, comforting him and looking into his eyes until he passed on. we are grateful for the time we were able to spend with him. I wanted to make sure his other human friends knew, and thank all of you again for letting Kotzebue be a part of our life, even if his time with us was much to brief. Copyright © 2019 Tails of the Tundra Siberian Husky Rescue, Inc. — All Rights Reserved. 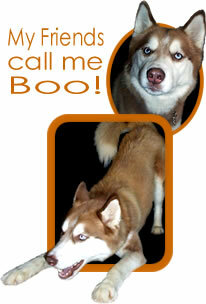 Tails of the Tundra Siberian Husky Rescue, Inc. is a 501(c)(3) non-profit organization.